Take the pastry out of the fridge 20 minutes before using. Mix the sugar and cinnamon together well in a bowl. Unroll the pastry, keeping it on the paper it comes in. 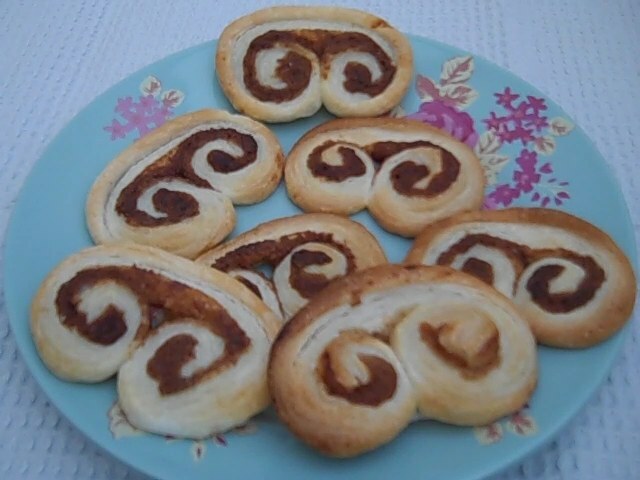 Sprinkle the sugar, cinnamon mixture all over the pastry, making sure you get it right to the edges then to make sure it sticks to the pastry use a rolling pin and roll it all over using gentle pressure, as you dont want to stretch the pastry just get the sugar cinnamon mix to stay put. 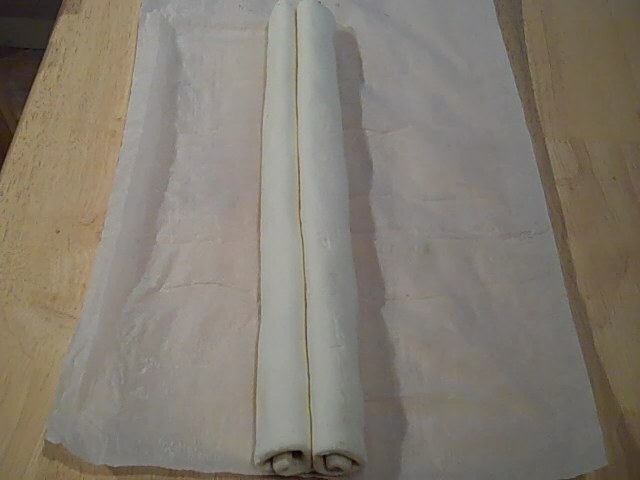 Starting at the long edge, roll the pastry up to the centre then do the same from the other long edge. So that you have something like the photo below. Now roll the pastry up tightly in the paper and place in the fridge for 20 minutes. This will help the biscuits keep their shape. Cut the biscuits into 1cm or slightly thinner slices and place them on parchment covered baking tins leaving room between them, remember this is puff pastry! Bake on a high shelf for 12 – 15 minutes until they’re crisp and golden brown (some of mine were a bit more than golden brown by the time the 4th baking tin went in the oven 😦 ). Leave on the tin for 10 minutes before placing on a cooling rack, take care as they are thin and crispy and will break easily. Tip: you could also spread Nutella on these as an alternative or even make savoury one’s by using pesto or parmesan. Delicious and perfect for a picnic, or even as a pudding, eat it hot with custard or cream. You could also use other fresh fruits ie: raspberries, peaches, blackberries, apples, apricots, prunes. Preheat the oven to 180C/gas 4. Grease and line a 20cm round cake tin, about 5cm deep. Sift the flour, cinnamon and caster sugar into a bowl. Make a well in the centre and add the egg, milk and melted butter, then combine with a wooden spoon or electric whisk. Beat well to make a thick, smooth mixture. Spoon into the tin and spread evenly. Remove the stalks and stones from the cherries, using a pitter if you have one (I don’t) to keep the fruit whole. Scatter the cherries over the mixture and gently press them in. To make the topping, tip all the ingredients into a bowl. Rub in the butter with your fingers to make a crumb-like mixture, then work the mixture until it comes together in pea-sized pieces. Scatter the topping over the cherries. Bake for 35 – 40 minutes until a skewer pushed into the centre comes out clean. 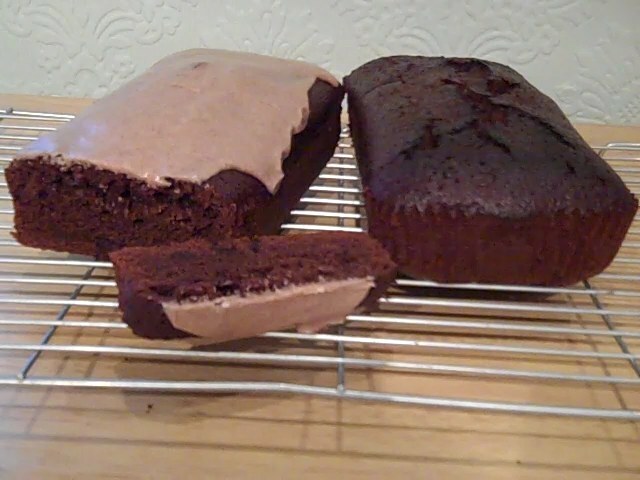 Leave in the tin until cool enough to handle, then run a knife round the edge, remove the cake from the tin and leave on a wire rack until completely cold. 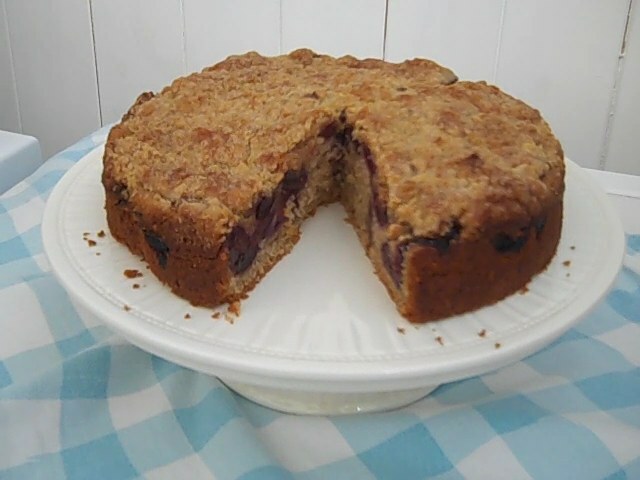 For a picnic, make the cake up to 24 hours ahead and return it to the clean tin when cold. Dust liberally with icing sugar, then wrap in cling film or foil.